Wilson’s second title Death By Living (Thomas Nelson), following the immensely popular Notes from the Tilt-A-Whirl, once again incorporates the author’s nearly-manic writing style that somehow manages to be both disjointed and steadily straightforward at the same time. This book is a times so hard to comprehend that the reader might wonder if it is, in fact, English; at other times, the author makes such profound statements that it felt less like reading and more like absorbantly knowing. Wilson’s essential point in the book is this: you’re gonna die. There’s nothing you can do to prevent it, there’s no amount of good you can do or legacy you can leave behind that will change it. But this is also decidedly not a book about filling the moments between birth and life with the greatest use of time. It just…is. What this book also demonstrates is the complete spirituality of our existence, regardless of where the reader place his own faith on the vast spectrum of belief. The author isn’t referring to religion, though, only spirituality and its impact on this life everyone lives before dying. Granted, this is an incredibly confusing book to read and at times I wanted to hold the author down, preferably tied to a chair, and administer some kind of medication that would cause the writing style to make more sense. But I’m certainly not a lesser person for having read it, and might even be someone who is now more aware. 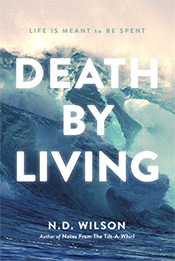 Death By Living is available now for pre-order from Amazon, Barnes and Noble, and more, and will be released July 30th.